Scorpions are considered as insects but actually, they are not. They have 8 legs and are different from insects. They are most famous for their deadly poison in their stinger. Scorpions have been living on the Earth for millions of years. They have changed very little as compared to ancient scorpions. There are about 1700 living species of scorpions, and only 25 of them have the deadly poison in their stinger that can kill a human. Scorpions look similar to lobsters. They have 8 legs, 2 pincers, and a larger stinger at their back. They have a wide variety of colors including yellow, black, brown, green, and blue. Their color depends on the location of their habitat, which gives them a good camouflage. The size of scorpions is changed from species to species. The smallest scorpion can grow about 0.5 inches in length and the largest can grow about 8 inches. Scorpions have a strong exoskeleton which gives them strength in a fight with its prey. Scorpions prefer to eat insects and some small rodents that are easily available in their habitat. They have a pair of pincers in front which help them to fight and hold the prey. Once the prey is grabbed, they usually paralyze it with their sting. Each species of the scorpion has a poison that is effective for only selected creatures. Scorpions are one of the creatures that are found across the world. They are found in deserts, forests, swamps, and mountains. They usually live in the small holes to avoid being spotted by their predators. Majority of the scorpions are not endangered. However, there are some species of scorpions whose population is small and are rarely found e.g. emperor scorpion. These rare species are protected under the law. 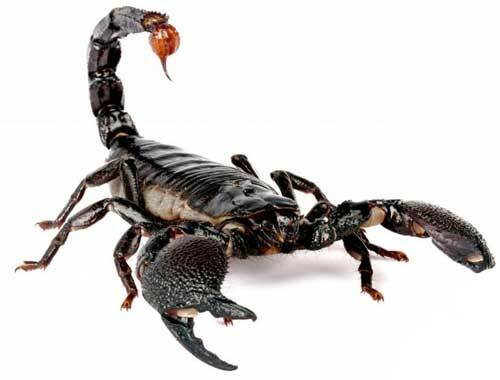 A scorpion can live about 6 years in the wild. However, some species are reported to live more than that. Scorpion’s eyesight is weak. They mostly rely on their excellent touch and smell sense. Mother scorpions carry their baby scorpions on their back until they learn how to survive. Abdul Wahab, "Scorpion," in Science4Fun, April 13, 2019, http://science4fun.info/scorpion/.